In April of 2018 political unrest broke out in the form of government protests in and around the capital city of Nicaragua. We understand that these protests bring concerns for planning our 2019 Music and Mission trip. It is possible the unrest could resolve itself prior to our trip, but it is also equally possible that it could escalate. For those reasons, we'll be using this webpage to keep you up to date on the status of our trip. As of right now we are moving forward with our trip planning. Please watch the video below to get a better understanding of how we are prepared to lead our team and ensure your safety while in Nicaragua. The field staff in Nicaragua are natives of the country and spend their days working in the communities and hosting tourists like us year-round. If they do not feel it is safe for us to travel into Managua, the capital city, they will inform us of that and we will cancel the trip accordingly. 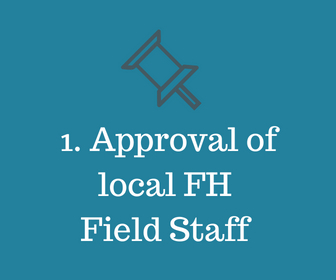 The staff members in Nicaragua also work directly with the team members at the FH headquarters in Phoenix, AZ and will be reporting directly to them about the current political unrest. If by October 1st the Nicaraguan and/or American FH employees feel it is in the best interest of our safety to postpone the trip we will do so. As of June 8, 2018 the US Department of State has rated Nicaragua at a level 3 travel advisory. This categorization recommends US citizens reconsider travel to the area due to political unrest and crime. In order for us to go ahead with our trip and book our flights, we are going to look for the travel advisory to be lowered to a 2 or 1. 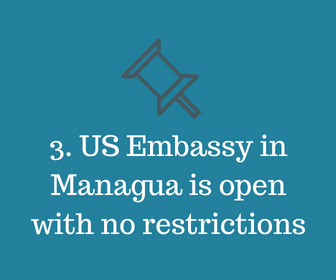 Over the past few weeks (as of 6/8/18), the US Embassy has been closed in Managua and has issued several security and demonstration alerts. In order for us to confidently book our travel, we are going to look for these alerts to cease and for the embassy to remain open and fully functional on a regular basis.